Hierarchy of Needs | What is the Meaning & Purpose of Life? As discussed in the prior section, the human need for self-actualization was first introduced in 1934 by Dr. Kurt Goldstein. Twenty years later, Dr. Abraham Maslow fully developed this concept and incorporated it into a theoretical framework on human motivation, which became . . . This framework was represented as a pyramid containing five levels of human needs, where the largest and most critical needs (i.e., sustaining one’s existence) were at the base — and at the summit, the need to be all that one can be. In other words, the human needs which are essential are at the bottom and those that are discretionary are at the top, and in between there is a gradual mix from one to the other. Physical Needs –These are necessary to survive, whereby their deprivation will assuredly result in death. These include the air we breath, the water we drink and the food we eat, as well as shelter and clothing for our protection from the elements. As living beings, we also fundamentally require sleep and the ability to excrete metabolic waste. Safety Needs — After the Physical Needs are substantially met, safety of one’s being next takes precedence, and comes in many forms. Collectively, they represent our yearning for a relatively predictable and orderly world in which inconsistencies and lack of fairness are rare, and the just and familiar are frequently experienced and therefore come to be expected. These include the need for personal security, financial security, health and well-being and protection from accidents, illness and crime. Death can result when these needs remain substantially unmet. Love /Belonging Needs — Once our core survival needs have been met, we focus our time and attention on relationship-based (or social) yearnings. These include fulfilling our need to love and be loved, and the sense of belonging and of being accepted by others. These needs pertain to friendship, intimacy with others and being with one’s family. When these needs are substantially unfulfilled, loneliness and depression typically set in, and in extreme cases can result in suicide or emotion-laden homicide. Esteem Needs — After we have substantially met our core survival and social needs through a firmly established sense of belonging, our esteem needs kick in and become more pronounced, and have two dimensions. The first pertains to the need to be respected by others for who we are, and to be favorably recognized for what we have accomplished and for what we are capable of. Fulfillment of these needs often take the form of fame, prestige and social status. The other dimension is entirely introspective and relates to our need for self-respect and self-esteem. When both dimensions of our esteem needs are met, we exude a recognizable self-confidence for we believe we have mastered what we do, and have “contributed” to society. At this point, we are well-positioned for self-actualization because of an inherent belief that we can do so much more . . . which is ALWAYS true. On the other hand, if our esteem needs remain substantially unmet for a long period of time, psychological maladies can set in, such as depression, a debilitating lack of confidence, or self-destructive behavior. 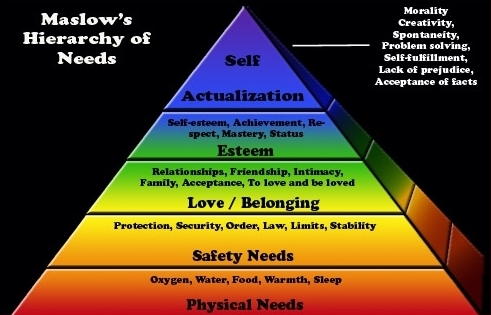 After Dr. Maslow’s death in 1970, others took up his work, and over time, three other levels of needs were identified for inclusion in the Hierarchy of Needs — two of them precede the need to “self-actualize” (Cognitive and Aesthetic needs) and one of them sits atop the pyramid (i.e., that which we ultimately strive for), and are referred to as Transcendence needs. The resulting revised Hierarchy of Needs is thus illustrated below. The Cognitive and Aesthetic needs assist in one’s quest for self-actualization; however they are not imperatives, but they certainly make the journey easier and far more enriching and enjoyable. And the need for Transcendence effectively takes self-actualization to the ultimate “next level”. Cognitive Needs (i.e., The Need to Know and Understand) — These needs pertain to a person’s thirst for knowledge, as well as need to understand of the world around them, based on that knowledge. These needs can be reasonably met, but never completely fulfilled for the more one’s knowledge grows, the more insatiable the need for more knowledge seems to be, along with a pronounced yearning for yet a “better” understanding their world. Aesthetic Needs — The need for symmetry, order and beauty are thought to also be prerequisites for self-actualization for they relate to developing an appreciation for what is beautiful in this world (be it art, nature, wildlife, music or just the clear blue sky), and a realization of what the finer things in life are. Transcendence Needs –There are a variety of definitions and interpretations of this term, however in the context of human needs, it pertains to those who have achieved self-actualization and feel the need to “give back” by helping others on the path to self-actualization. This is accomplished through a limitless variety of means, ranging from mentoring others to many forms of philanthropic pursuits. Now armed with an understanding of our needs, why we are on this earth, and how self-actualization can bring lasting happiness, how does one “make this happen”? You are invited to proceed to the next section titled “Applying the Concepts“. Great fan on this site, a great deal of your articles or blog posts have truly helped me out. Looking towards news! I’m very appreciative of your kind words, and I’m especially pleased that this blog has helped you out in some way. It’s in reality a nice and useful piece of info. I’m happy that you just shared this useful info with us. Please stay us up to date like this. Thank you for sharing. Awesome blog! Do you have any tips for aspiring writers? I’m planning to start my own blog soon but I’m a little lost on everything. Would you suggest starting with a free platform like WordPress or go for a paid option? There are so many options out there that I’m completely confused .. Any tips? Thank you! Woah this blog is fantastic i love studying your articles. Keep up the great paintings! You understand, lots of people are hunting around for this information, you could aid them greatly. I’ve been surfing on-line more than three hours nowadays, but I never discovered any fascinating article like yours. It is beautiful worth enough for me. In my opinion, if all webmasters and bloggers made excellent content material as you probably did, the web will likely be much more useful than ever before. Wow, incredible weblog layout! How lengthy have you been blogging for? you make blogging look easy. The entire look of your web site is magnificent, as well as the content material! Wow, amazing weblog layout! How long have you ever been running a blog for? you make running a blog glance easy. The total look of your web site is wonderful, as neatly as the content! Thanks for your contribution and I will use it for my college research that I am doing for this website.